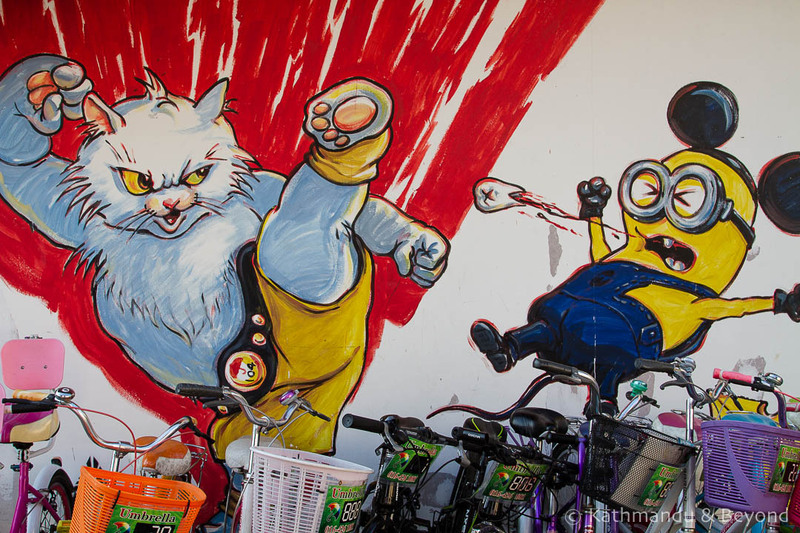 Seeking Out Street Art in Penang: The Street Art Capital of Asia! 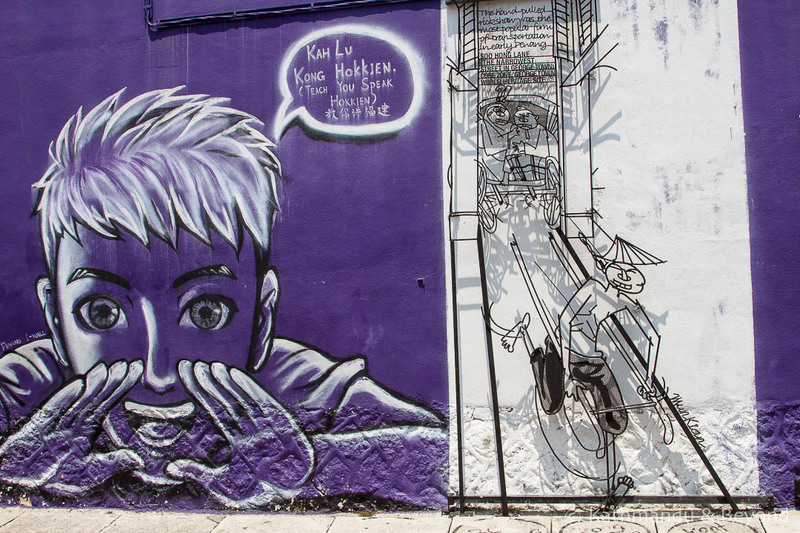 Unlike some cities, where street art is tucked away in less salubrious parts of town and not easy to find, you don’t have to search very hard to find art in public places in Penang. 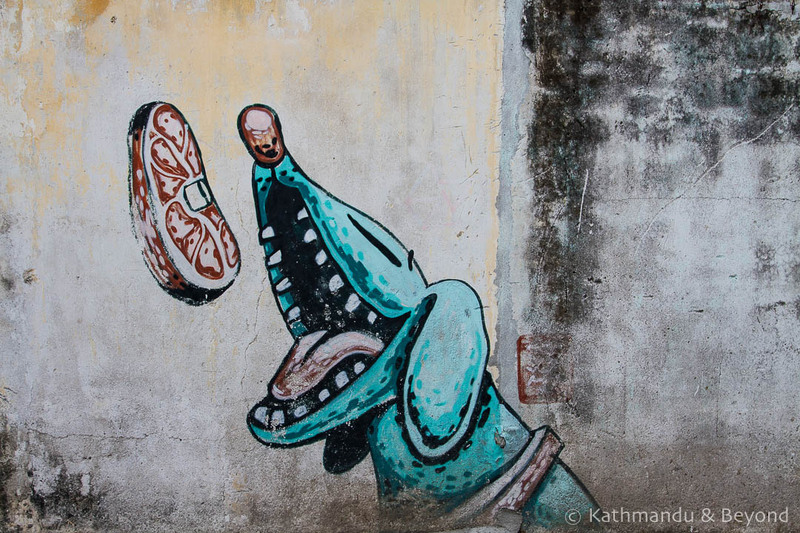 If you’re in George Town, the islands lively multi-cultural capital, you can’t miss it. 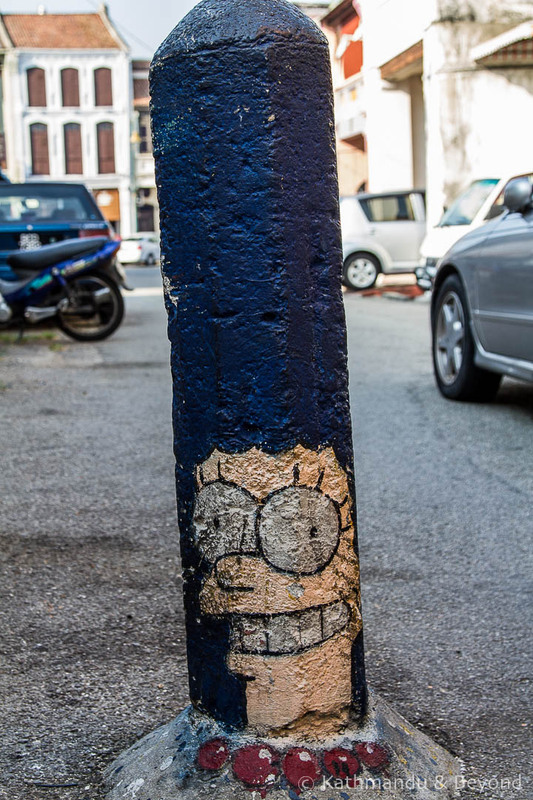 Street art is everywhere. And there’s a lot of it. 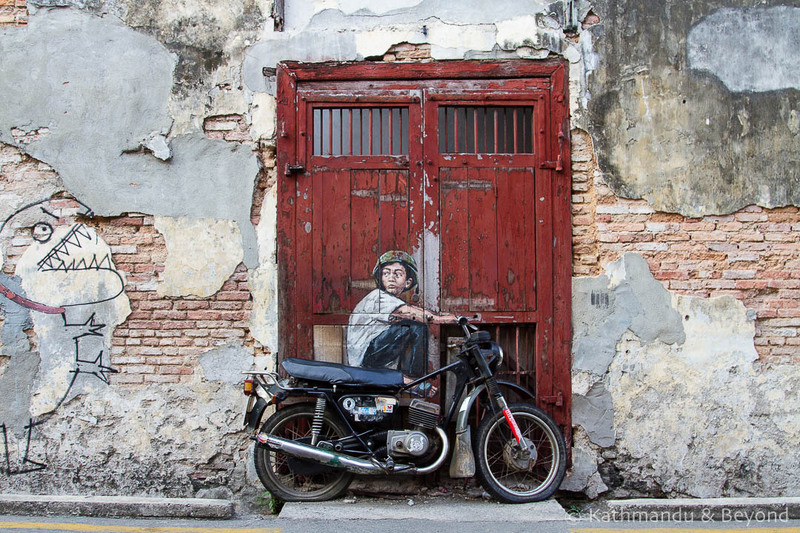 Trishaw Man by Ernest Zacharevic. 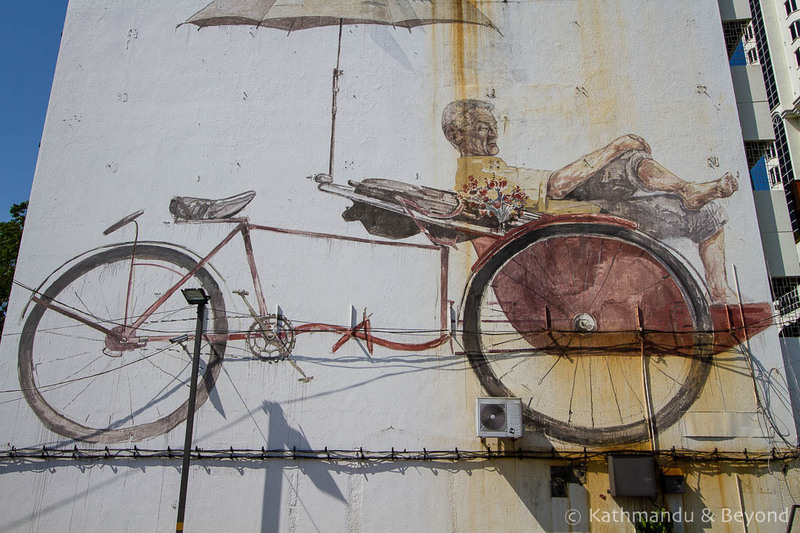 One of the first murals to appear in Penang, trishaws used to be a popular mode of transport in Penang. 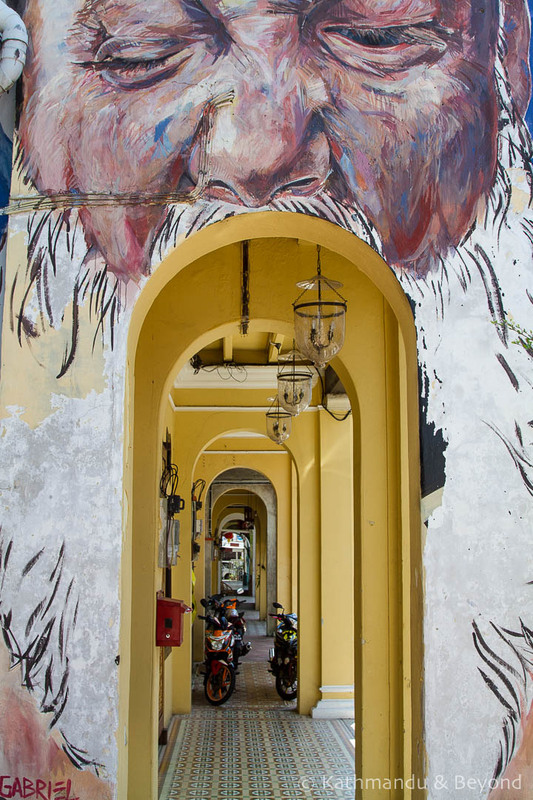 It’s almost impossible to wander around George Town’s historical UNESCO-listed centre for any length of time without coming across the town’s most famous painted murals. 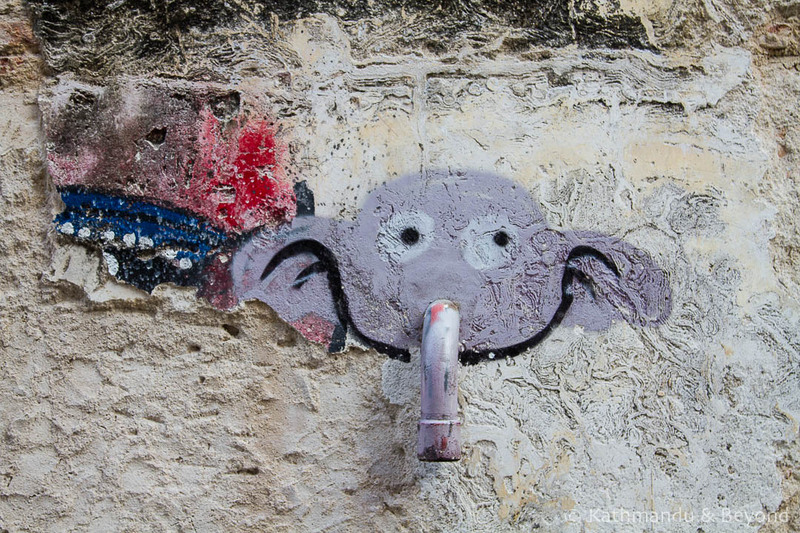 Just look out for groups of tourists who from a distance appear to be photographing a blank wall, or camera-toting map-in-hand visitors heading down seeming innocuous alleyways that couldn’t possibly hold anything of interest to the average tourist. 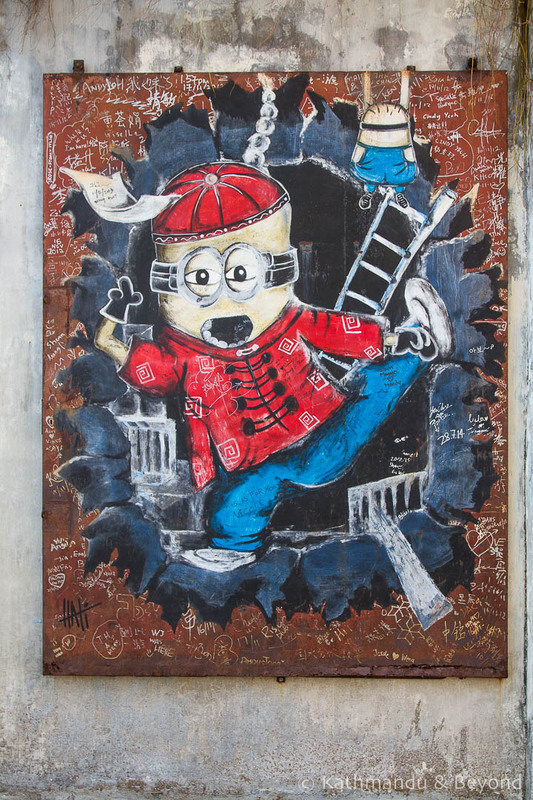 Given my love of street art, you won’t be surprised to hear that on our recent visit to Penang, we were amongst those snap-happy, map-scouring visitors! 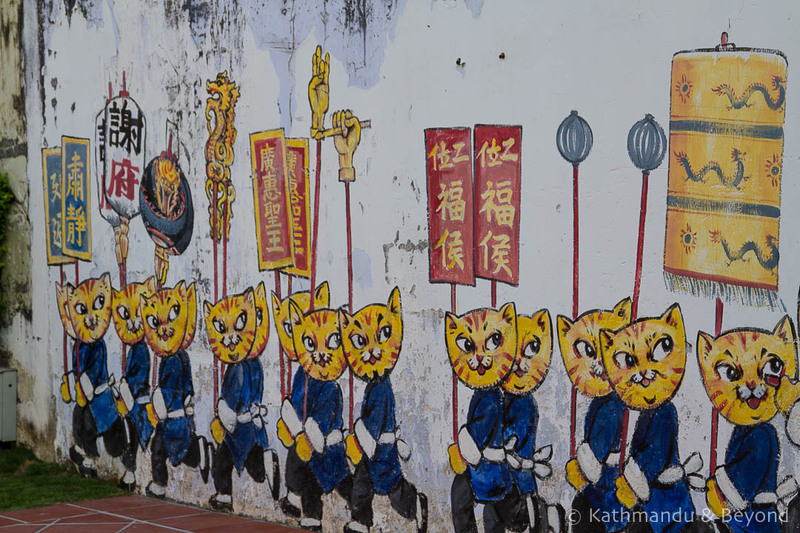 It’s about six years since we were last in Penang and around twenty-two years since my first visit! 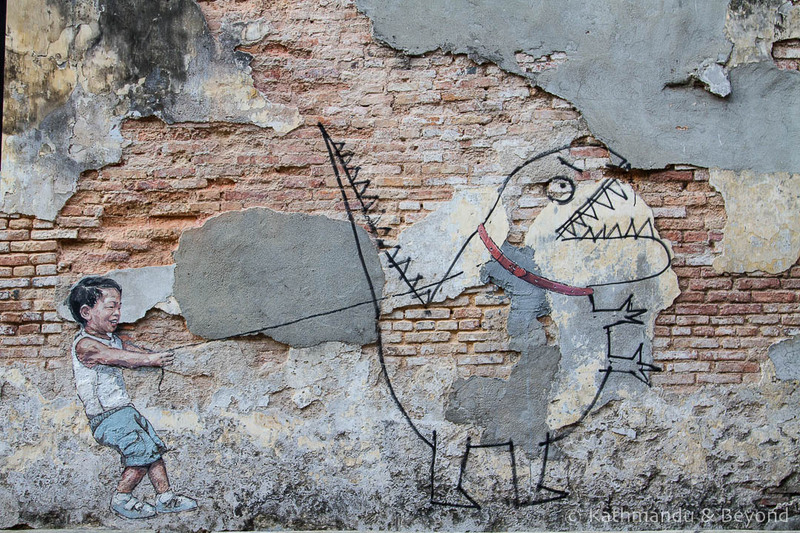 Back then street art wasn’t a thing. 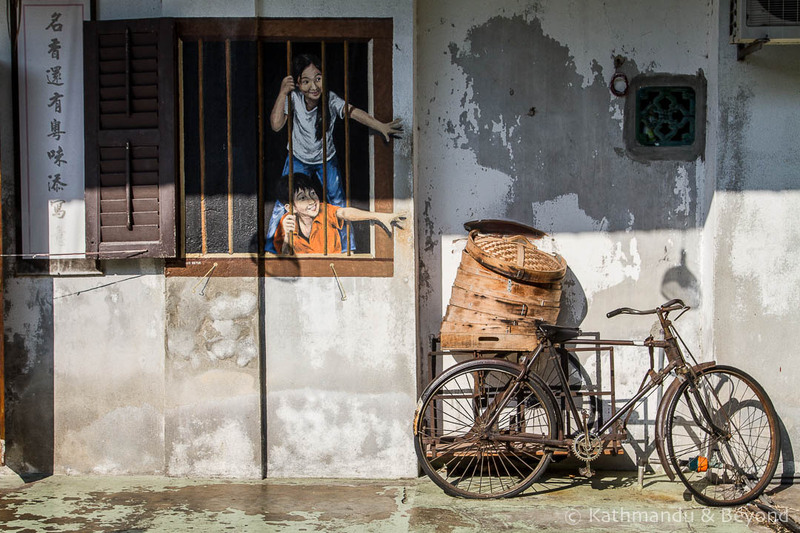 But over the past few years, the scene has exploded and today the island is home to some of the most famous examples in Asia, if not the world. 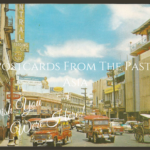 In September 2008, George Town was inscribed by UNESCO on the World Heritage List and one year later the Penang State Government held a competition to come up with ideas to help brand the town as a World Heritage Site. 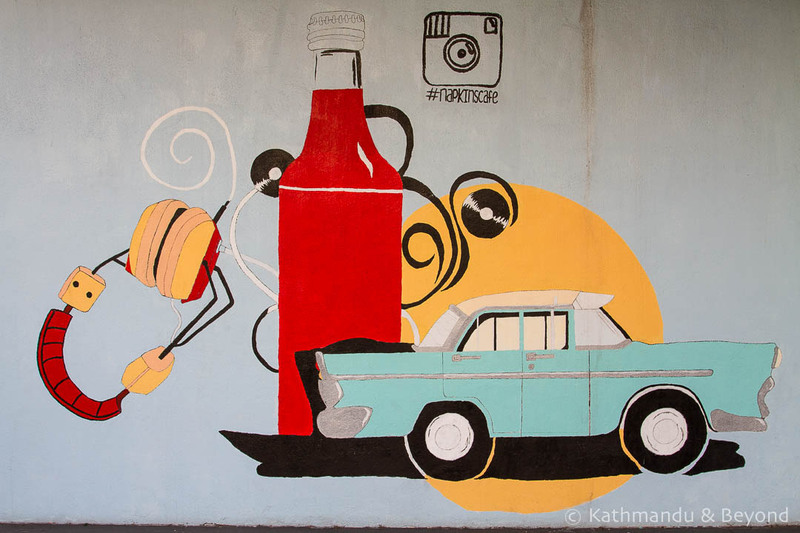 The campaign was aimed at exploring art and design in public spaces. 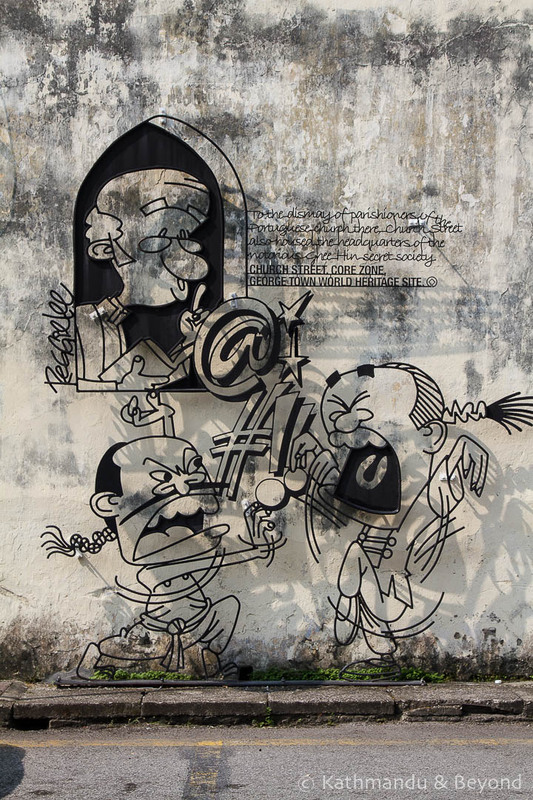 One of the initiatives to come out of the event was a series of wrought iron sculptures which give the appearance of sketches against the city’s walls. 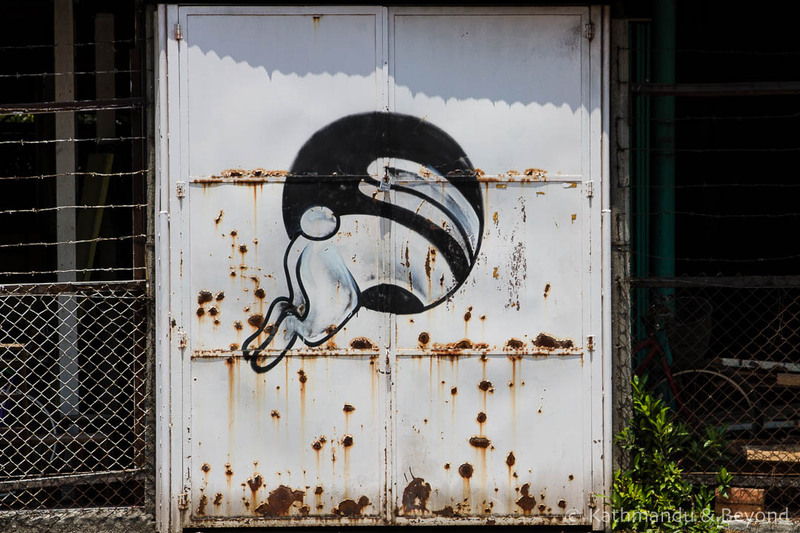 The number of these iron artworks rivals the amount of street art and are also very hard to miss. 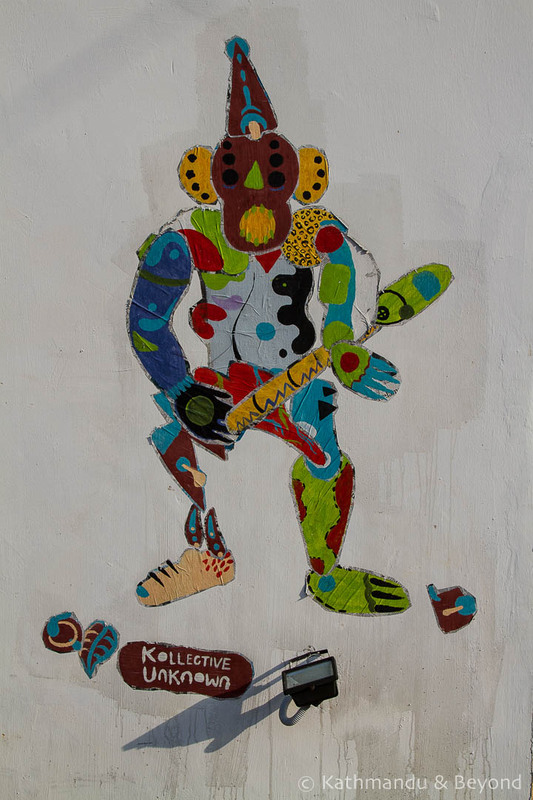 The details in some of the artworks is quite incredible and they are particularly interesting because they impart little snippets of history about the locations they are found in. 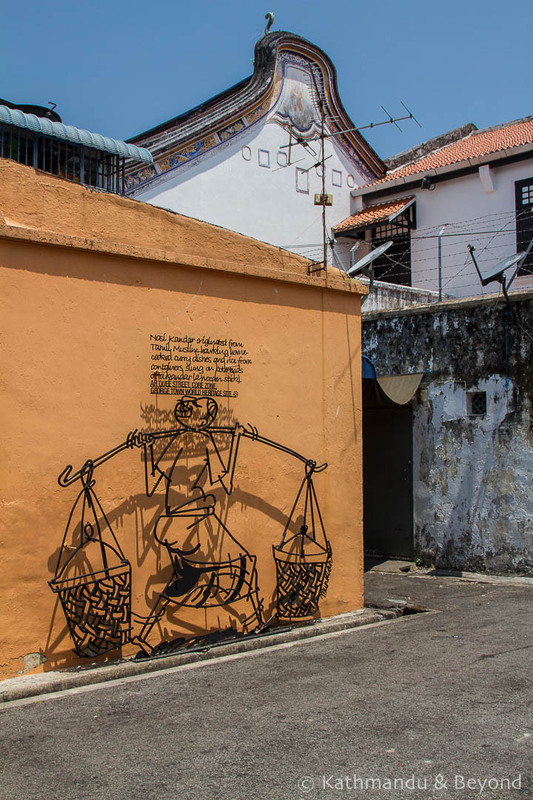 There are currently fifty-two such pieces of wrought iron sculptures dotted around George Town. ‘Kandar’: Nasi Kandar originated from Tamil Muslims who hawked home cooked curry dishes and rice from containers slung on both ends of a Kandar (Wooden Stick). 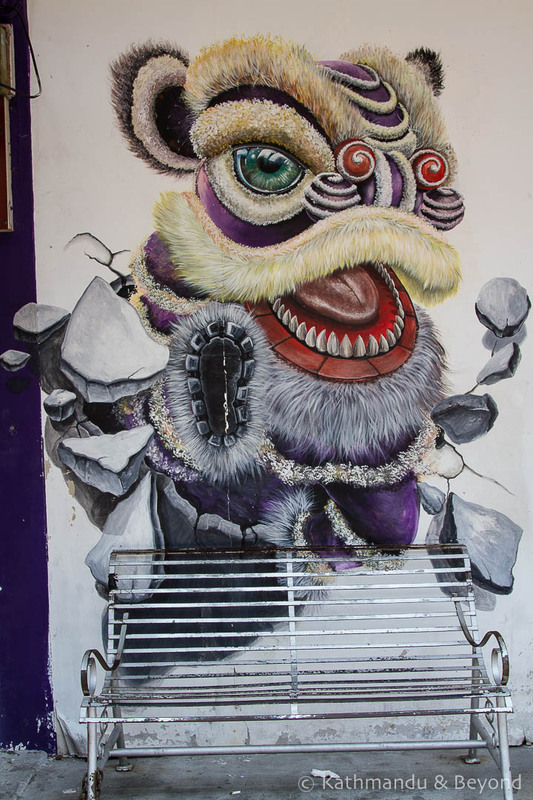 For example, the piece called Three Generations which is found on Kimberley Street, a street famous for its hawker food, reminds you that some stalls have been there for three generations. 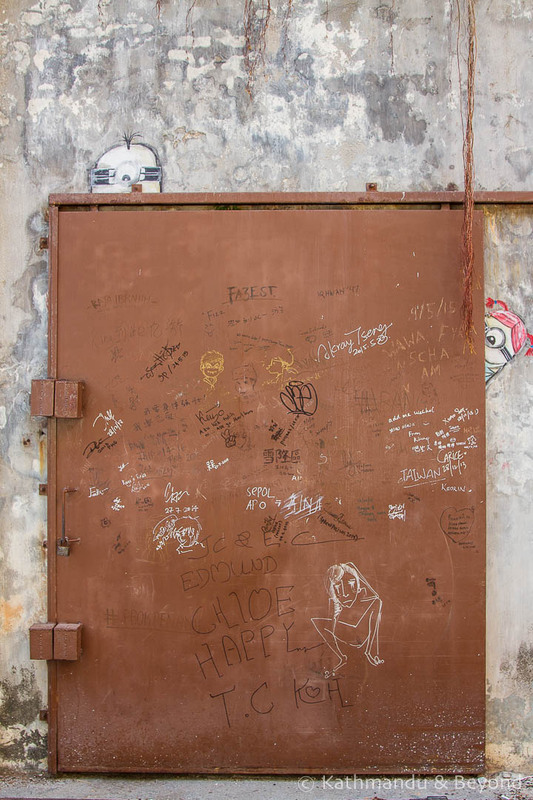 Jimmy Choo can be found at the spot where the famous shoe designer started his apprenticeship and Too Hot, on Weld Quay, marks the place where the spicy Indian noodle dish Kepling Mee was created to whet the appetite of sailors and port workers. 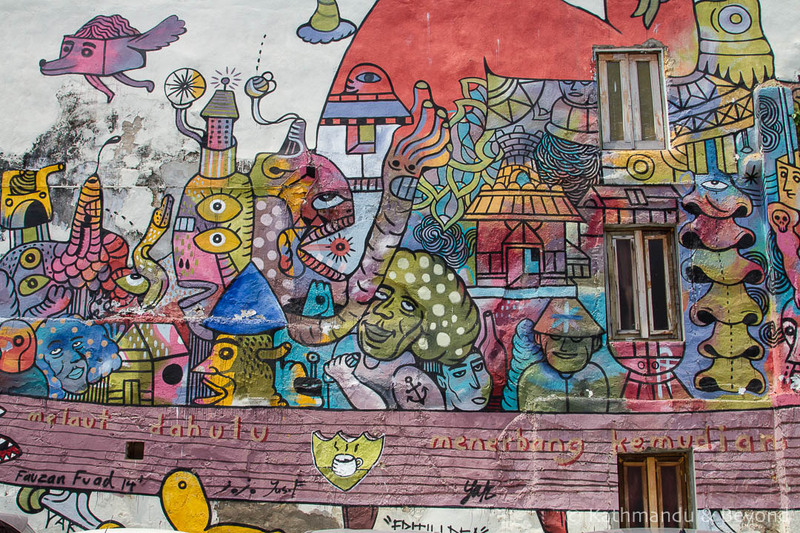 You can probably guess what activities the streets where artworks named Gold Teeth, Shorn Hair and Cheating Husband are located are famous for. 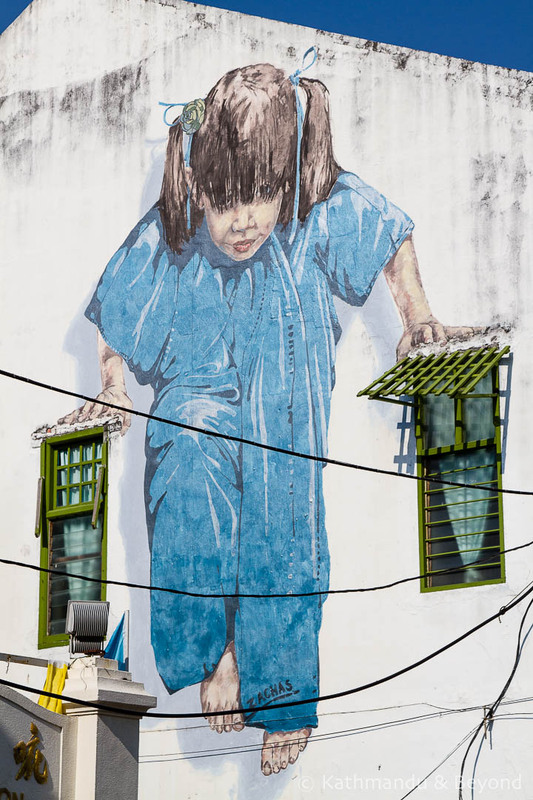 In 2012, Lithuania-born Ernest Zacharevic was invited to paint a series of murals at part of the George Town Arts and Culture festival under the banner of Mirror George Town. 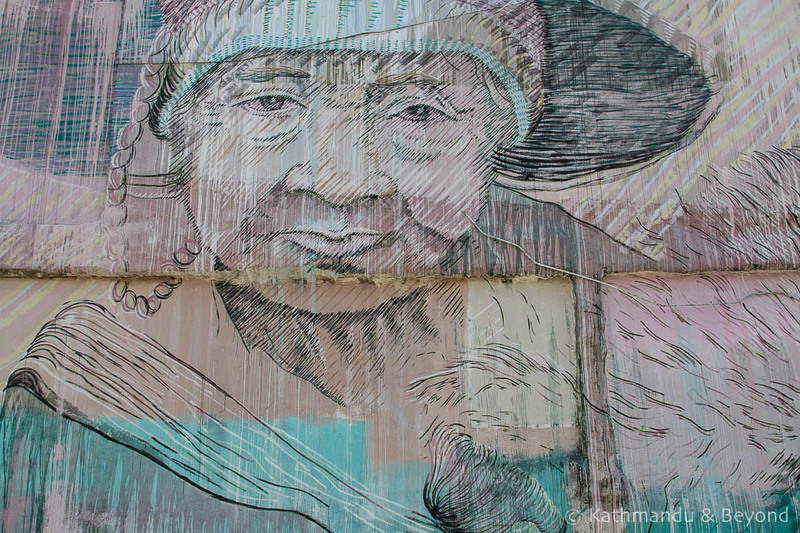 It was his first major public art project and resulted in a phenomenal public response. 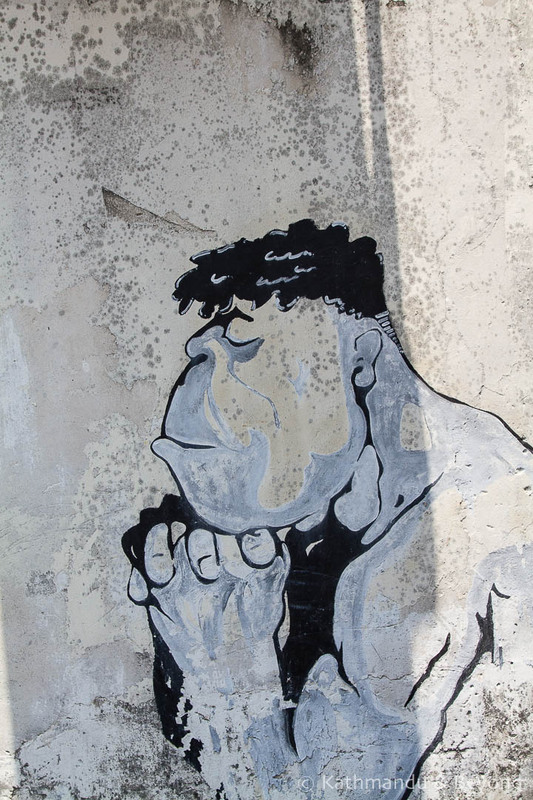 His work now adorns walls around the globe and is one of the most famous street artists today. 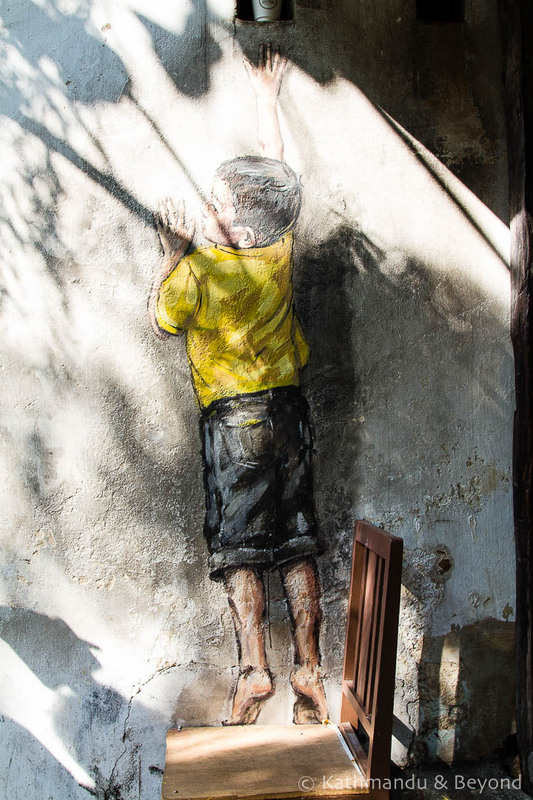 Unfortunately some Zacharevic’s work has faded in time, although he has touched up some of them, and one of the nine pieces is no longer there. 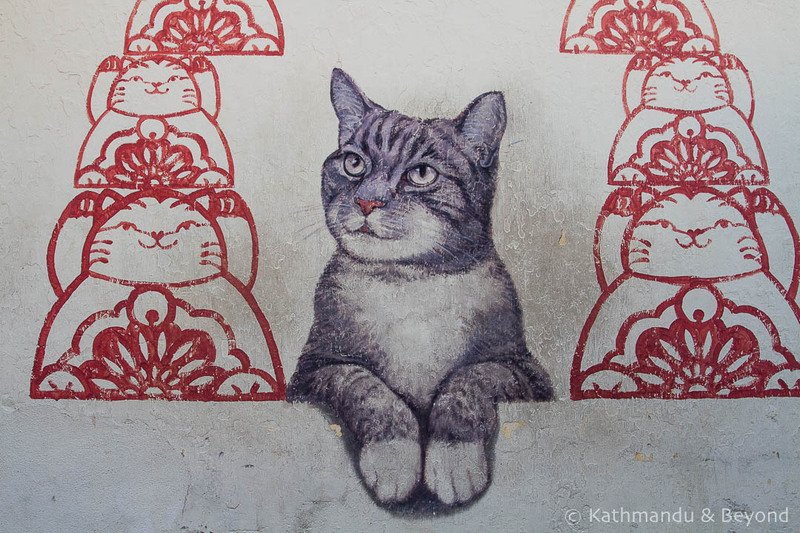 Numerous other collaborations and projects in George Town have followed including the 101 Lost Kittens project which was part of the 2013 George Town Festival. 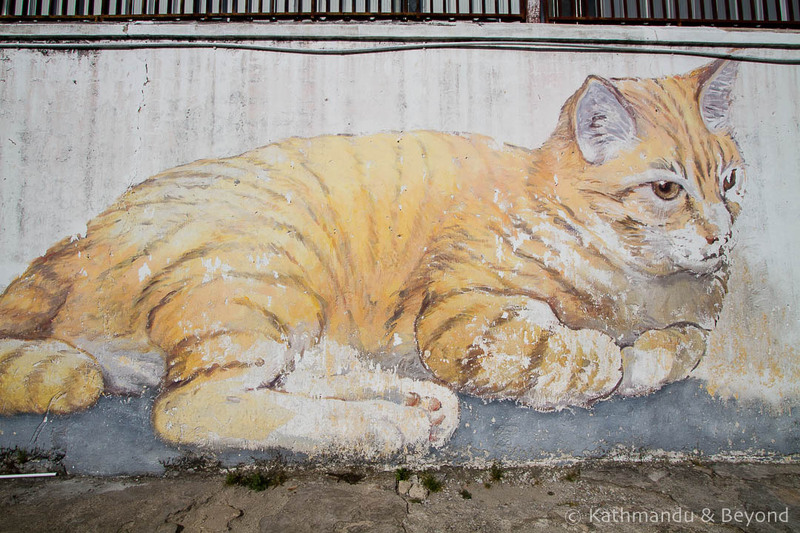 A group of artists known as Artists for Stray Animals (ASA) have created a series of murals to help create awareness over the issue of helping find homes for stray animals. 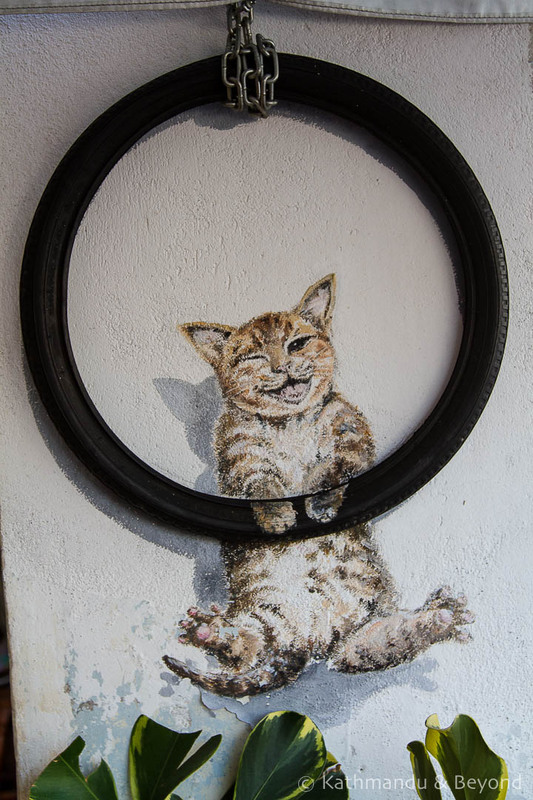 Love Me Like Your Fortune Cat by ASA. Fortune cats are those nodding cat dolls that are often found in Japanese and Taiwanese restaurants, near the cashier. 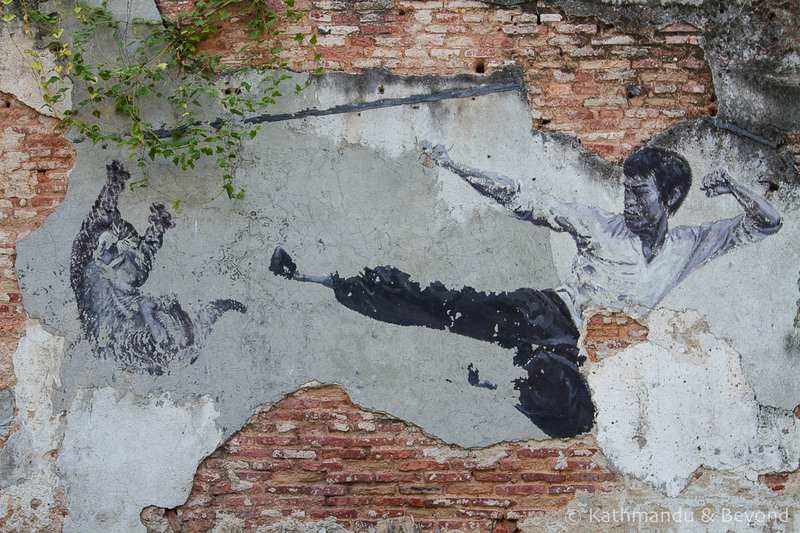 This is, after all, a photo easy and street art is a very visual medium so, without further words or ado, here are a collection of images of Penang’s street art. 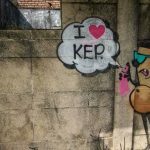 These photos by no means represent all there is to see and the map references below will help you locate these artworks and more. 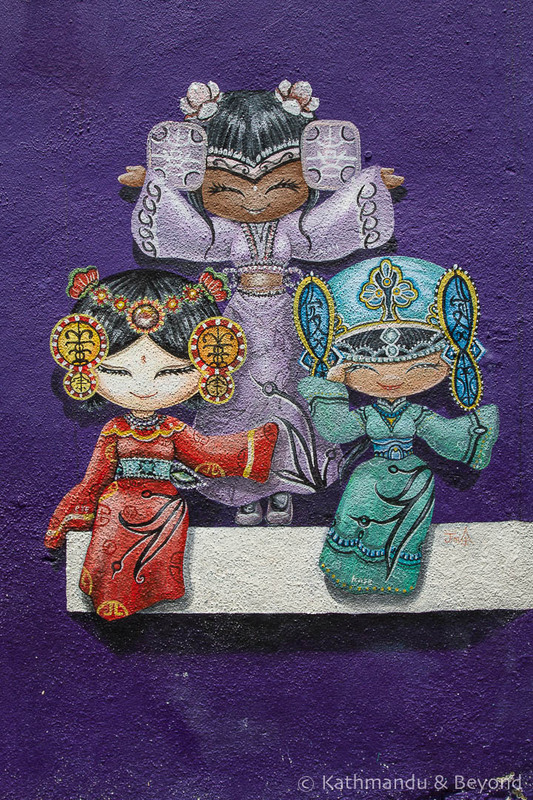 These two small murals are located on the corner of Lebuh Armenian and Lorong Armenian: Culture Girls is a small but detailed piece depicting three girls in traditional costumes and Lion Dance depicts the traditional dance performance that mimics a lion’s movements. 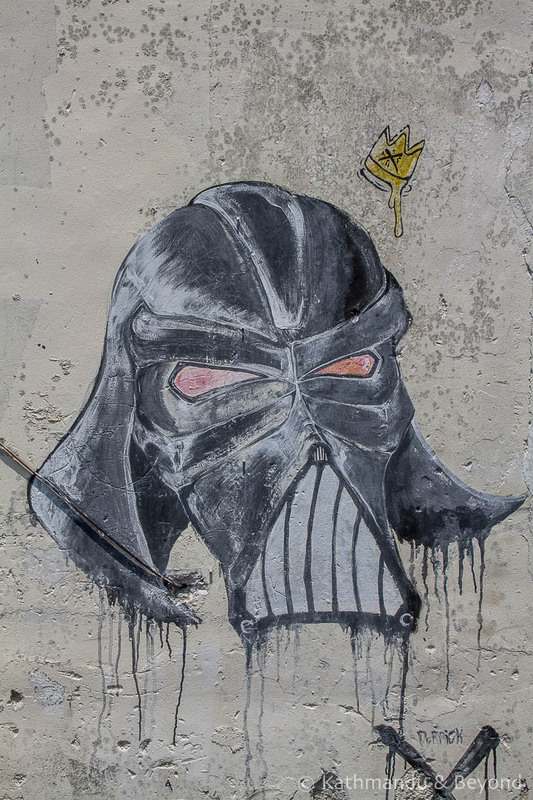 Street art in George Town is well-documented and there are already numerous posts and online resources that can help you identify the locations. I’ve therefore decided not to painstakingly create a map showing them all. 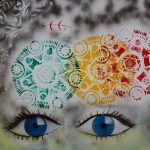 Instead, here are a few useful links that will help you. 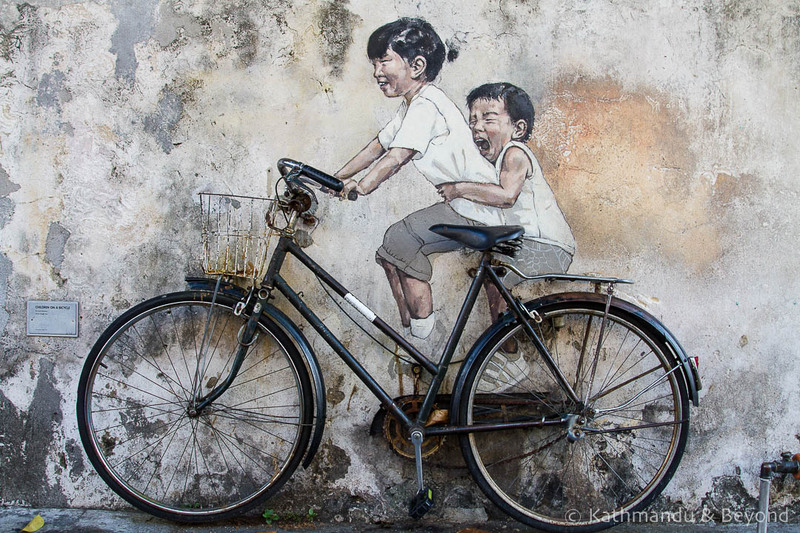 Penang Tourism produces PDF guide to George Town’s street art which pinpoints the most famous pieces of art as well as the iron sculptures. 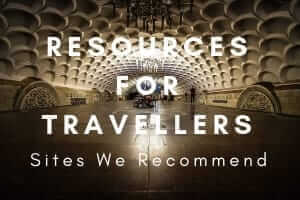 This guide is available as a printed map and as a useful free app (download from Apple’s App Store or Google Play) which contains a What’s On guide, listings of everything there is to do and see in Penang, and interactive maps. 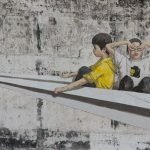 This detailed post by The Occasional Traveller is very up to date with the locations of Penang’s street art and features a great interactive Google map (last updated February 2016). Because it contains so much detail, I didn’t waste my time creating an inferior version! 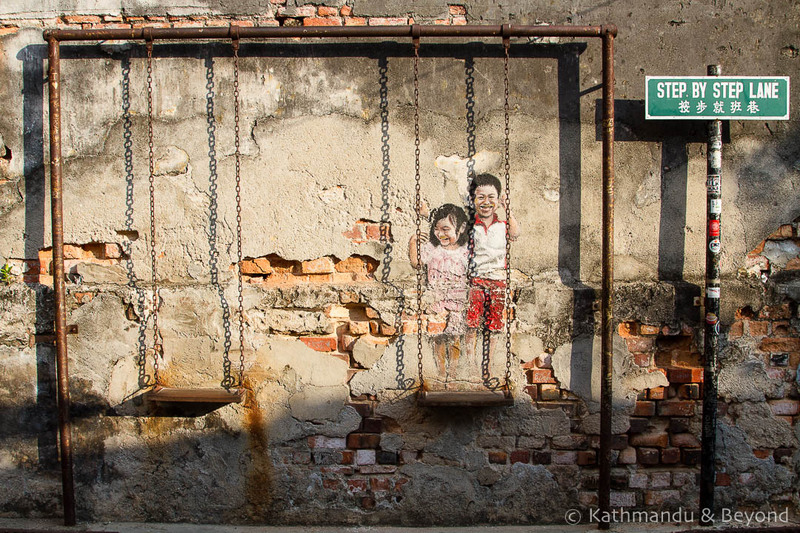 A guide to the locations of Ernest Zacharevic’s street art in Penang can be found here. 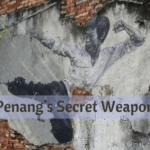 And finally, if you’re looking for ideas of what else to do in Penang, check out this article from Malaysia expert, Island Drum, which we contributed to with our top tip on where to eat the best Indian food in Penang. 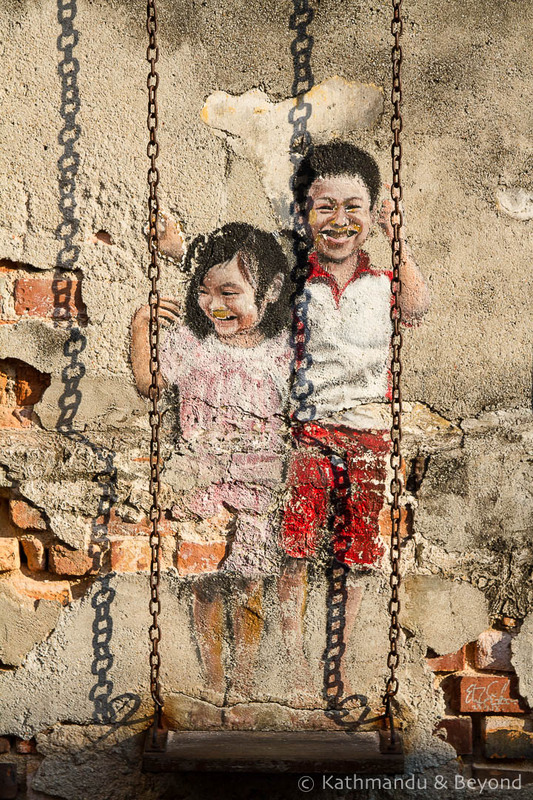 ‘Brother and Sister on a Swing’ is one of Penang’s most photographed pieces of street art and features two young children, a boy and a girl, standing on a swing.